For what seemed like a really long time (the only way I can describe it), C Restaurant occupied some prime real estate right by False Creek. 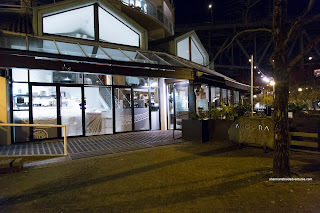 Overlooking Granville Island and out into English Bay, the place had the location down pat. Food was good too with Chef Robert Clarke at the helm. However, the place just didn't quite make it with questionable service. Finally, it bit the dust much the other Harry Kambolis establishments such as Nu and Raincity Grill. 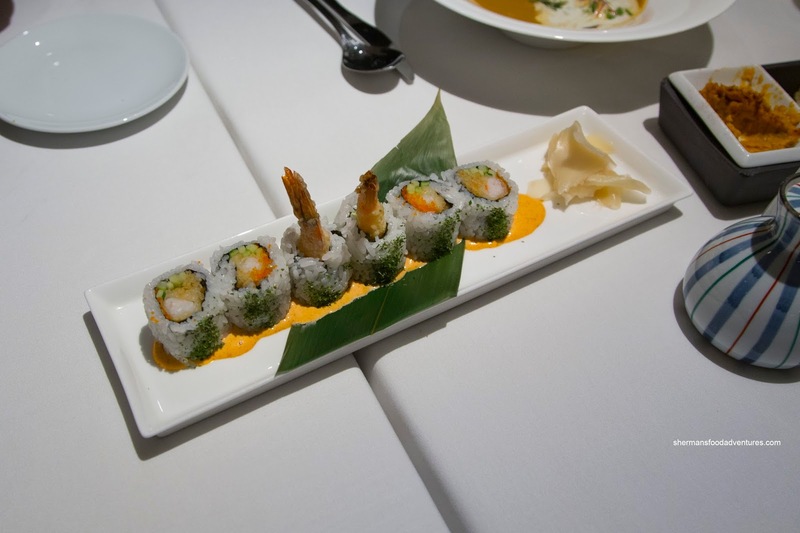 Taking its place is Ancora featuring Japanese Peruvian cuisine. We finally had some time to check it out. 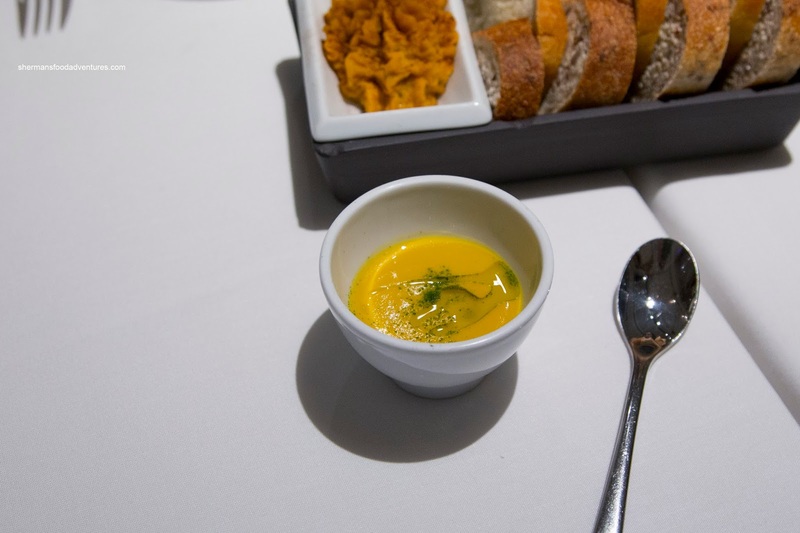 Prior to our actual appies, we were presented with an Amuse Bouche of butternut squash soup with kale powder and olive oil. Although this was only a small taste (as it should be), it was impactful. It was silky and rich where it went down smooth. 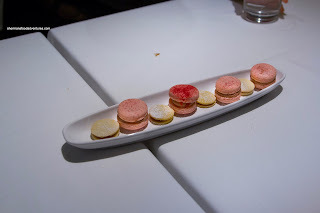 The flavours were super intense being sweet with an equal amount of saltiness. I could have had a large bowl of this, but hey, we needed to save our appetites for the rest of the dishes! 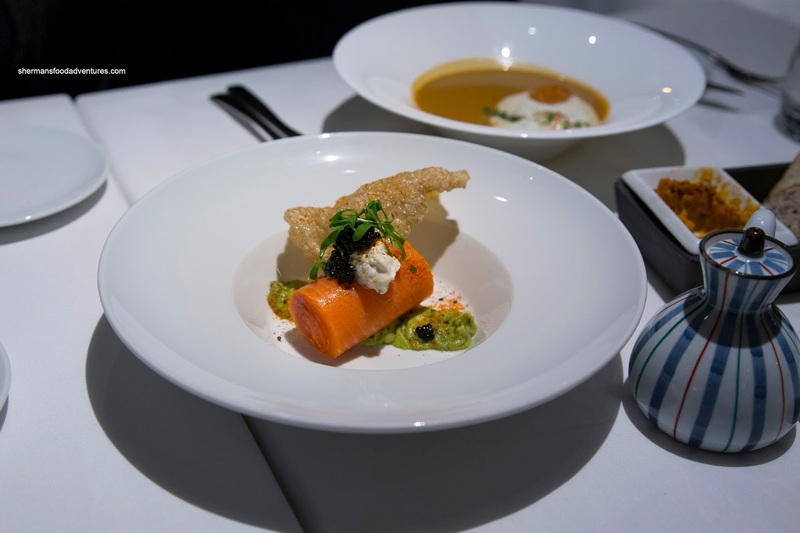 For my starter, I had the Barely Cooked Steelhead Trout which was neatly rolled atop skin chicharron, avocado puree and topped with lemon crème fraiche and herring caviar. Probably better described as raw (which I prefer anyways), the trout was buttery, sweet and soft. I thought the thick crème fraiche was tart enough for impact while the caviar on top was lightly briny. The most noticeable ingredient on the plate was the bright and herbaceous creamy avocado. 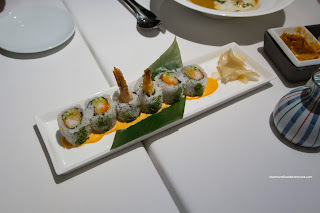 Viv went for the prix fixe menu and began with the Tempura Prawn Roll with masago, cucumber and spicy mayo. This was a pretty substantial appie featuring chewy sushi rice that was a bit dense. Inside, the crispy prawn was meaty and nicely prepared. Despite the large amount of spicy mayo, the flavours were actually quite mild. 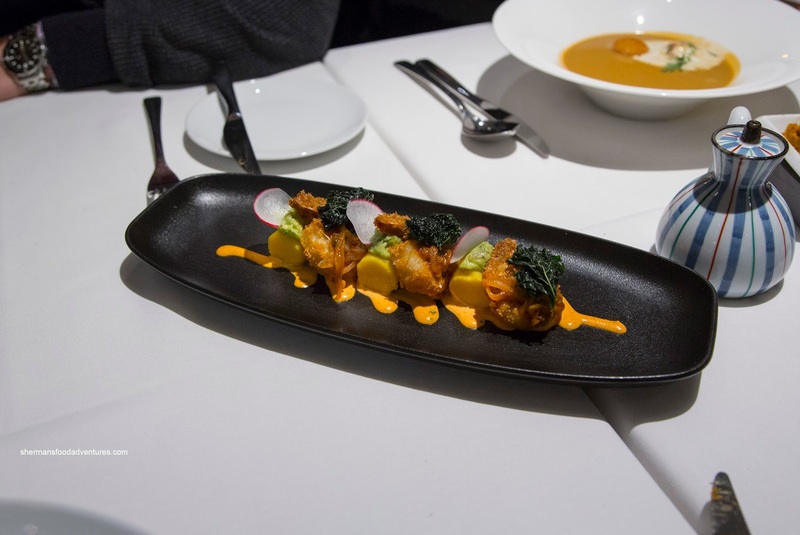 Costanza was intrigued by the Peruvian-inspired Spicy Prawn Causa sporting tender spiced Yukon potatoes. Sandwiched in between them were crispy and meaty prawns that were beautifully cooked. Flavours were impactful and robust due to the combination of avocado mousse, kale chips, rocoto-harissa and escabeche sauce. 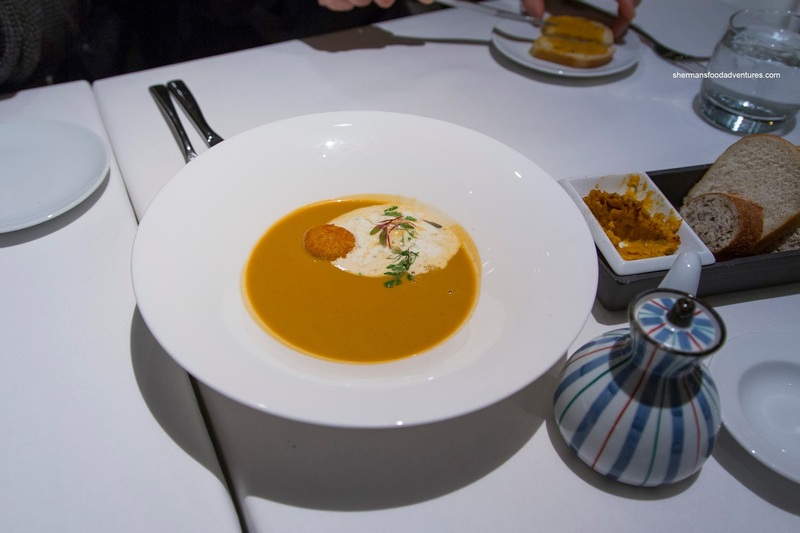 There was this creamy and spicy initial hit that gave way to a variety of herbs and brightness. Costanza thought this was the best of the appies. I agreed mostly with that statement, but Elaine's Lobster Bisque was a real treat too. 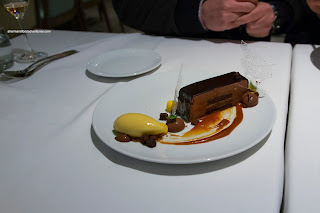 It was super rich yet wasn't heavy as they showed restraint with the cream. There was the classic aroma of lobster shells that was deeply impactful without being super salty. This was poured table side onto a crispy black cod croquette and chive crème fraiche. For my main, I had the Grilled Big Eye Tuna served rare. As much as I had difficulty cutting into the slices of tuna, they ate very well. 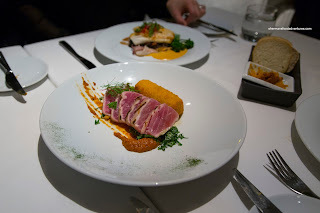 With a light taste of the sea, the tuna was buttery soft while retaining a bit of firmness. The real star of the plate was the fantastic Romesco sauce that was nutty, sweet and ever-so-lightly tart. It complimented the fish without killing its natural flavour. Underneath, the acidic kale salad added the necessary brightness to the dish. I found the salt cod croquette to be crispy with a mildly salty and dense filling. 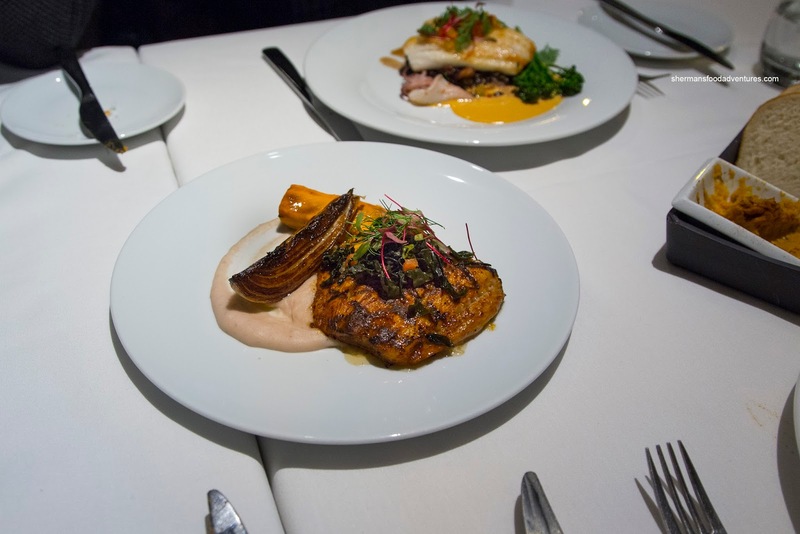 Costanza also ordered fish in the Aji Panca Glazed Sablefish with yam & oregano pavé, roasted fennel, wakame chimichurri and ocopa sauce. Compared to my relatively mild-tasting tuna, this was outright a slap in the face with a deeply savoury glaze that was slightly sweet. 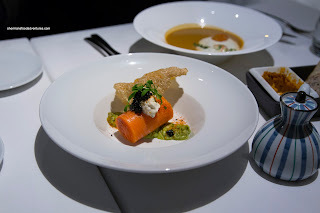 The fish itself was buttery and flaky, yet exhibited caramelized flavours. 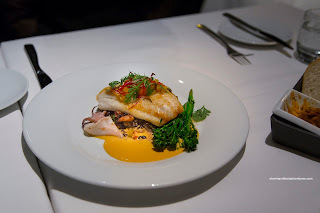 Viv and Elaine both had the Pacific Ling Cod atop forbidden rice chorizo paella with shrimp, baby squid and Peruvian corn. The fish itself was nicely seared on the outside while mildly seasoned. It was a bit on the firmer side though. I really enjoyed the chewy rice as it was flavourful and the amount of ingredients was generous. The pimenton emulsion was predictably cheesy and salty, which was certainly interesting. It was powerful enough to give the mild fish a kick start. 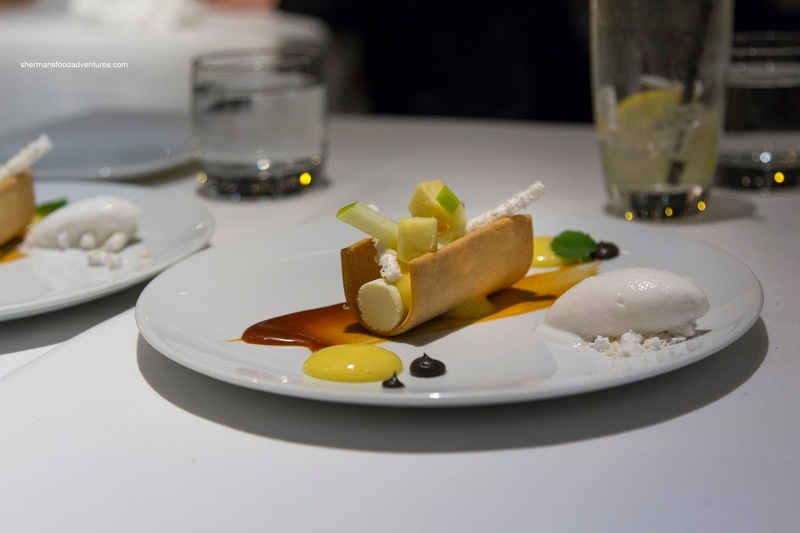 Viv and Elaine picked the same desserts as well in the Yuzu-Passionfruit Tart with coconut sorbet, rum caramel and black sesame gel. This was a refreshing way to end the meal where the flavours were tangy, lightly sweet and aromatic. We thought the thick rum caramel really worked when combined with the more subtle-tasting ingredients.